A dependence is some third-party code your app uses. For example Zend Framework 3 is the dependence for your website. In Composer, any library is called a package. All packages installable by Composer are registered on Packagist.org site. With Composer, you can identify the packages that your app requires and have Composer to download and install them automatically. "serve": "php -S 0.0.0.0:8080 -t public/ public/index.php"
In that file, we see some basic info on the skeleton application (its name, description, license, keywords and home page). You will typically change this info for your future websites. This information is optional, so you can even safely remove it, if you do not plan to publish your web application on Packagist catalog. What is interesting for us now is the require key. The require key contains the dependencies declarations for our application. We see that we require PHP engine version 5.6 or later and several Zend Framework components, like zend-mvc, zend-mvc-form, etc. The commands above will self-update the Composer to the latest available version, and then install your dependencies. By the way, Composer does not install PHP for you, it just ensures PHP has an appropriate version, and if not, it will warn you. If you look inside the vendor subdirectory, you can see that it contains a lot of files. 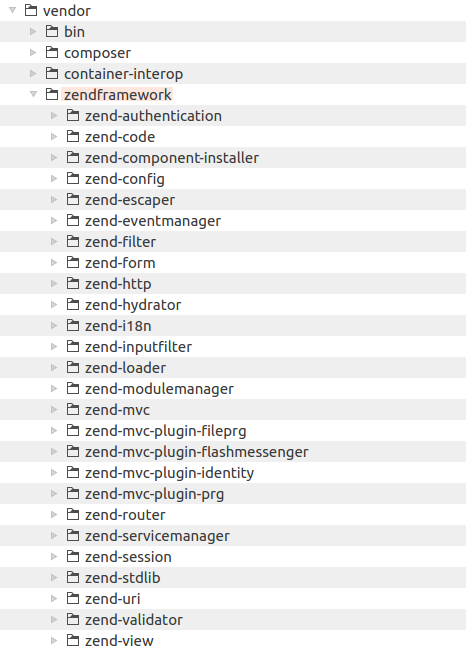 Zend Framework 3 files can be found inside the APP_DIR/vendor/zendframework/ directory (figure 2.2). In some other frameworks, another (conventional) way of dependency installation is used. You just download the dependency library as an archive, unpack it and put it somewhere inside of your directory structure (typically, to vendor directory). This approach was used in Zend Framework 1. But, in Zend Framework 3, you are recommended to install dependencies with Composer.